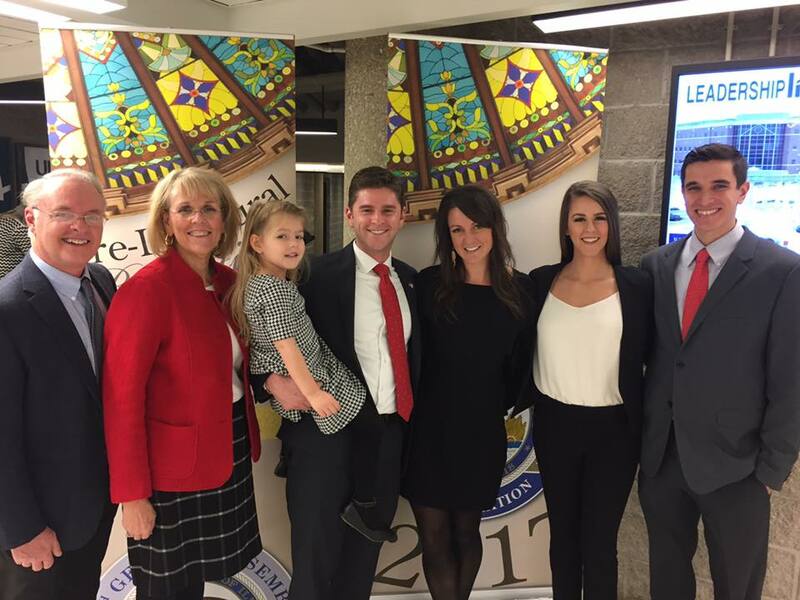 State Representative Ryan Spain was sworn in to his first term in the Illinois House of Representatives on Wednesday during the inauguration of the historic 100th General Assembly held at the University of Illinois-Springfield’s Sangamon Auditorium. “I am honored to serve in the 100th General Assembly, as Illinois approaches 200 years of statehood. We have large challenges ahead in our state and I look forward to the opportunity to applying common-sense solutions to the problems we face. I am humbled by this opportunity and will work hard to try to bring jobs and people back to a reformed, more prosperous Illinois,” said Spain. A lifelong Peorian, Spain attended District 150 schools and is a Richwoods High School alumnus. He graduated from the University of Illinois at Urbana-Champaign with a double degree in political science and speech communication. Spain also holds an MBA from Bradley University. In April 2007, Spain was elected to the City Council. He is currently employed at OSF Healthcare System as the Vice President of Economic Development. Spain and his wife Ashley have a three-year old daughter named Vivienne. Spain has always enjoyed spearheading initiatives to bring jobs and economic growth to the region. He was proud to serve as the driving force in Peoria’s Warehouse District, which has become a mixed-use district that is bringing both businesses and residents back to the core of the city. In his professional life, as a healthcare manager, he has seen firsthand how government decisions are affecting the private sector and how lessons learned by the private sector can be applied to challenges in government. Rep. Spain is also announcing the location and contact information for his Legislative District Office. Rep. Spain will be taking over the current lease for Rep. David Leitch’s office on the campus of Illinois Central College North in Peoria. The mailing and street address is 5407 N. University St., Arbor Hall, Suite B, Peoria, IL, 61614. The telephone number also remains the same at, 309-690-7373. Rep. Leitch’s longtime Chief of Staff, Linda Daley, will also stay on to transition the office and casework for a period of time. “It was important to me to maintain a high-level constituent service, as voters have rightfully come to expect in this district. By keeping the legislative office location and contact numbers the same, we are not only saving taxpayer dollars, but are also making for a smoother transition for those we serve,” said Spain.